Carlow, a bright and modern town . 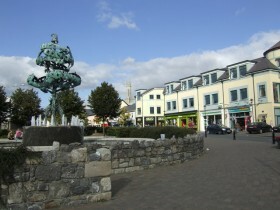 Carlow is a very popular location for a hen party. To help you plan your hen party in Carlow, we’ve compiled a useful list of places to stay, where to eat and the pubs and clubs that we recommend your hens should visit. Ewings Bar is a traditional Irish pub in Carlow which offers a great cocktail menu. It is probably not a pub that you’ll spend all night in but worth visiting for a drink or two. The Med Bar is very popular with hen parties. It has a lively atmosphere and always has some form of music whether it be a live band or a DJ. Tully’s Bar offers live music and chart hit playing DJ’s. Mainly attract a fairly crowd. Scraggs Alley is very spacious with 11 different areas in the place. It has an impressive smoking area and beer garden. Music provided by live bands and later in the night, a DJ. It can get very crowded. Teach Dolmain is great for live traditional music if that’s what your hens are into. The Foundry Nightclub is part of the Dinn Ri hotel and is very hen party friendly. Contact them in advance to arrange a VIP area and some bubbly or complimentary passes. Ewings Bar offer B&B accommodation for hen parties in Carlow. It is quite basic but has a very central location and is not expensive.